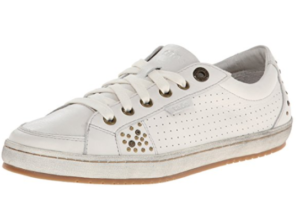 The Taos Freedom are women’s leather sneakers. 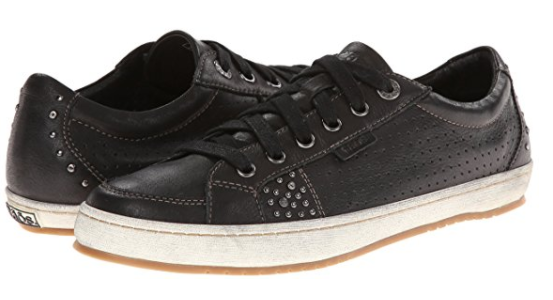 They come with a street style which reminds you of a classic Converse look but surprises you with their foot support and comfort. The simple and laid-back look goes well with causal and semi-formal outfits. 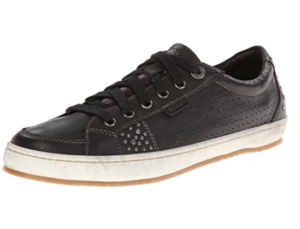 The Freedom’s leather upper stretches out well and makes it comfortable for walking on solid surfaces for long hours. However, it may need extra insoles for walking comfortably on uneven surfaces such as gravel roads, and cobble streets. -Users with high arch also find it comfy. -It fits like a glove and the feet stay comfortable all day. 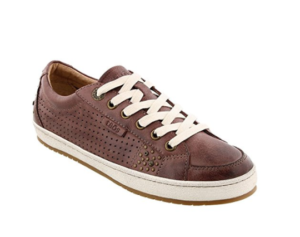 -The y are cute and get you lots of compliments. -The grey appears more taupe brown than on photos. -The shoe is not suitable for walking on slippery trails. 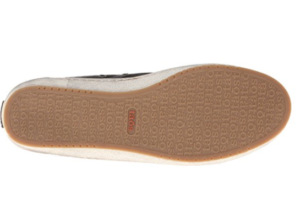 -To some users the footbed is a bit thin, and it needs extra insoles to walk comfortably on gravel or pebble surfaces. 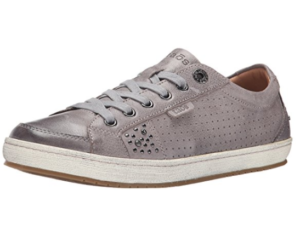 The Taos Freedom is a women’s causal walking shoe. 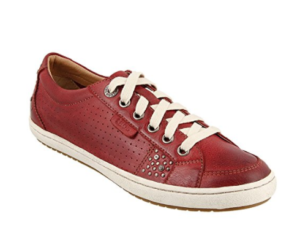 The cute leather shoe with lace-up style gives a customized fit. The color collection includes white, red and black to match with your styles. A majority of users are happy with the comfort level and its simple low-profile style. It is idea for walking in the city, running for errands, hanging out or for doing tai chi class! The Freedom has a silhouette which is similar to the popular Converse but gives a bit more sophistication in the casual look. 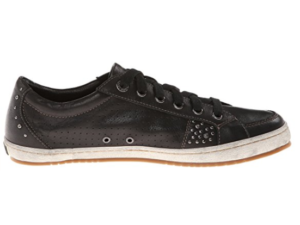 The rivers and perforation detailing on both sides of the shoes add a right amount of street elements to the look. Under the low-profile and flat appearance, the Freedom also has built in surprisingly good arch support and nice cushioning. 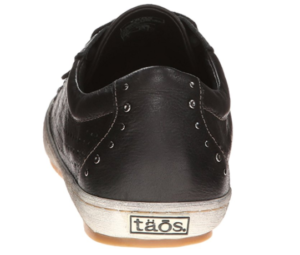 Some users who owned several Taos shoes find the Freedom model gives them the best support they need. Some users with knee or foot issues find this Taos shoes a gift as they can walk hours without suffering their feet hurting. 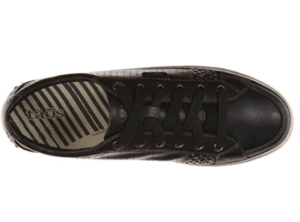 The stretchable leather upper are available in a wide range of colors. The shoe can stretch out and become form fitting after wearing for a while. Some users do find the black leather is softer than the brown one. The shoe runs slightly small. Many choose to order half size up. 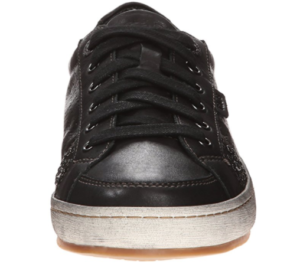 The leather upper is stretchable and fits like a glove. 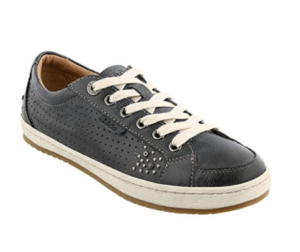 The shoe comes in soft leather upper and cushioned footbed with Soft Support™. Users feel the weight and pressure on the foot has been evenly distributed when walking in the shoe. The only noticeable downfall is the shoe’s sole. Some wearers find the rubber outsole is not thick enough and feel pressure when walking on pebble or gravel roads. The threads on the bottom threads don’t have enough traction when climbing on slippery slopes.